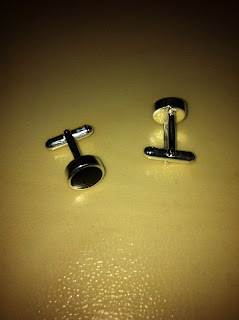 When I was up in Whitby in October my family treated me to some rather nice cufflinks which you can see in the picture. They are quite elegant and are solid silver with jet in the middle. I love them and so far haven't worn anything else. They can also be used for the 31st October at Halloween parties should I decide to turn up as a Vampire.